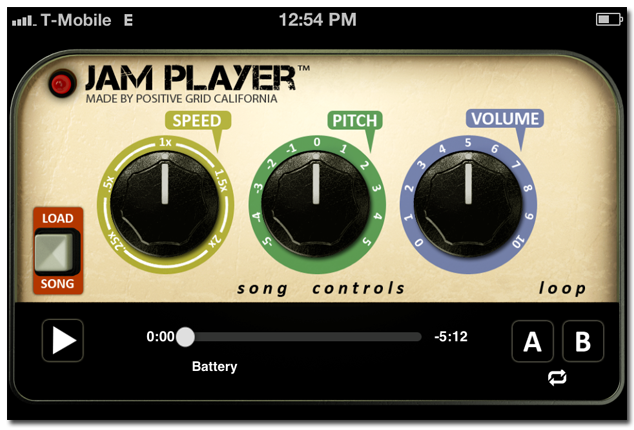 Jam Player, Other software for iPhone / iPod Touch / iPad from Positive Grid. Positive Grid announced the release of a trio of new iOS music-utility apps: Beats Metronome, Jam Player, and AccuTune. Beats Metronome can be set to 35 different time signatures, including compound and complex meters. It also sports a tap-tempo function and 17 different click sounds. Turning on Flash Mode in the Settings page enables a strobe-like flash on each beat (it can also be set to flash only on the downbeat). This mode can be useful onstage or in other low-light environments. A different type of graphic depiction of the beat is provided when the Visual Beats function is turned on and the iOS device is rotated to landscape mode. The display changes to show circles that represent the beats in a measure. As the metronome counts the time, the appropriate circle is highlighted, providing a visualized version of the tempo. Jam Player is an app designed to make learning and practicing songs easier by letting the user manipulate the tempo and pitch of a recorded song. The first step is to load a song into the Jam Player from the iOS device’s iTunes library. The Speed control knob can then be used to slow down the tempo of the song without affecting its pitch. For instance, a super-fast guitar solo could be slowed significantly to make it easier to learn, and then sped up periodically as the player becomes more comfortable with it. The Pitch control raises and lowers the pitch but has no impact on the tempo, a way for a singer who’s learning a song to change the key of the original track to match his or her vocal range. Using the Speed and Pitch controls in tandem allows for manipulation of both variables. As its name suggests, AccuTune is a chromatic tuner. 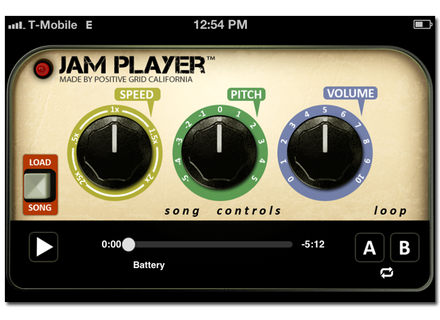 It responds either to notes captured by the iPhone or iPad’s microphone, or through a guitar adapter like Positive Grid’s JamUp Plug. It provides two different views: the top of the screen is a standard meter display and the bottom a note-wheel. Pressing the Setup button brings you to the Settings screen, where you can change the calibration from the default 440 Hz, set transposition, adjust temperament, and more. Beats Metronome and AccuTune list for $4.99 and Jam Player for $9.99. However, all three are available for the introductory price of 99 cents. Check out Positive Grid for more details. Pioneer rekordbox Mobile The mobile version of rekordbox is now available on the Android and iOS app stores. Steinberg Nuendo Live to 5 Crossgrade Offer Steinberg recently announced their worldwide crossgrade offer that allows users of Nuendo Live to purchase Nuendo 5 at a 15% discount. UVI IRCAM Prepared Piano UVI joined forces with IRCAM to bring you this special instrument.